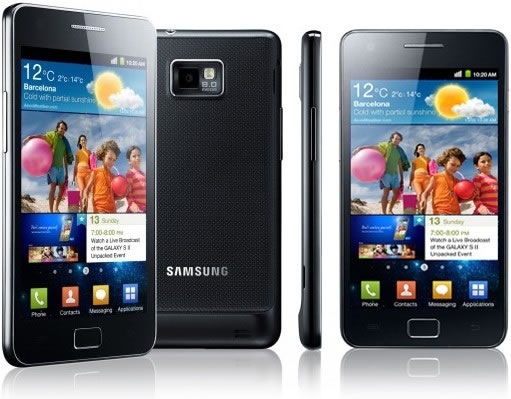 Samsung Galaxy S II – The Best Smartphone There Is? It’s been topping sales charts around the world, but is the Samsung Galaxy SII the best Android phone you can buy? In a world where phones are commonly coming with dual core chips, does the Samsung offer that little extra that pushes it to the top of the pile? If beauty is only skin deep the Samsung is a good looking device, if a bit iPhone 4 lookalike. It’s a super-slim 8.49mm and surrounded by a shiny metal bezel with the Samsung logo on top. It’s also amazingly light, a tiny 116g – amazing for something with a 4.3in screen. It’s also notably sturdy, especially for something that’s made from plastic. In fact it’s almost as well built in the hand as the uni-body HTC’s – quite an accomplishment. It’s inside, though, that the Samsung really shows its quality. Its packing a 1.2GHz dual-core Exynoss processor with 1GB of RAM and is perfectly responsive and quick for all tasks. Streaming video is excellent as is playing games and to be honest it is probably one of the quickest processors available on any phone currently, including the Motorola Atrix or the new HTC Sensation. So no matter however power sucking your live wall paper is or how heavy the apps you’ve opened are, the S II can cope with them without breaking a sweat. One of the most notable things about Samsungs, particularly the previous Galaxy S,are the excellent Super AMOLED screens and fans will be happy to hear that the new offering is even better than previous incarnations. The 480×800 Super AMOLED Plus screen produces punchy colours and deep tones. Though the resolution isn’t quite as high as some of its competitors, Samsung’s display manufacturing expertise show through and the screen is easily a match for anything on the current market. Samsung are also well known for making phones with top quality cameras and the 8megapixel version packed into the S II is no exception.It can take great still images and even record video at 1080p. It comes with a single LED flash and some good software for modifying and playing around with your pictures on camera via the TouchWiz interface and the Gingerbread operating system. TouchWiz has also been scaled down, which makes it unobtrusive and allows Android 2.3 to function at its best. It does have the traditional four hubs for social media, music, gaming and video and some applications pre-loaded, but it is generally pushed to the background. To make the most of the Galaxy S II Samsung have offered it in both 16GB and 32GB editions with the option of adding up to 32GB with an SD card. HDMI links are provided through a Micro USB to HDMI cable and the Galaxy also has Samsung’s SwiftKey text input – making messages and emails quite a lot easier. Overall, the Galaxy S II is an excellent phone – quick, pretty, and solid with a great screen and a great operating system. It’s in a tough league with the Apple iPhone, Motorola Atrix and HTCs galore, but it certainly manages to keep the pace and in some areas gets its nose ahead. Is it the best there is? That’s ultimately a matter of opinion. But it’s a definite contender. This is an article by guest blogger Cormac Reynolds. Cormac is a writer for UK based mobile phone comparison site Best Mobile Contracts. If you also wish to make guest post check our guidelines here. AppMoney – A New Way To Recharge For Free! How To Record Screen In Landscape Mode OnePlus One & Yureka YU Devices!